Last weekend I saw an exhibition of paintings by a local artist. These paintings were silhouettes, with, to me, the background being the strong pastel shades you briefly see about an hour after sunset or an hour before the sun rises. This set me thinking – let’s see what I can do photographically. The weather for yesterday evening was forecast as being cloudless so the next thing I had to worry about was a subject. There’s an old wind tower within walking distance of where I live, so I set off there. 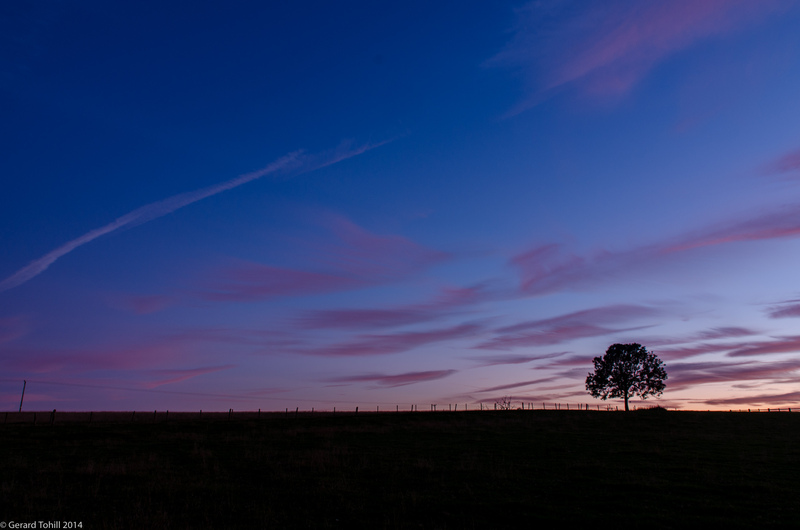 The wind tower is in a relatively low area however, so it was clear I wasn’t going to get the effect I wanted from that, but then I spotted this lone tree on the skyline – exactly what I was looking for. I spent a happy couple of hours working away until it got dark – then off home by the light of a head torch. As it turned out, there was some cloud about, but this actually made for some nice images. I seemed to get the best effect by taking a meter reading from the sky, and then underexposing by one stop. This accentuated the colours in the sky whilst making the ridge and tree a nice black. Photography stuff: 18-70mm lens at 18mm, 4 seconds at f/9.0, tripod, remote release, a little bit of editing in Lightroom to make the foreground black and bring out the colours. Beautiful shot, great composition and the silhouette is amazing. Well done, cheers! Stunning! The clouds to add to the silhouetted feeling of the landscape. I can see why you were pleased. It also proves that art is art and should not be divided into categories. You’re welcome and yes I can appreciate the plan results. I’m still working on my theatre marquee project although it gets more difficult with the theatres being further and further away.